Top 3 GDPR resources...because you're almost out of time! 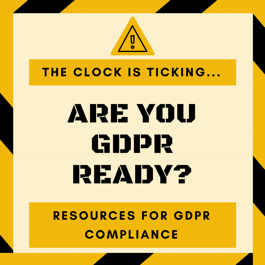 We know many of you are concerned about Friday's GDPR implementation deadline, so we've put together a quick list of resources that can help you sort through what's needed. Remember, anyone who gathers information from online visitors in the European Union (even if they are not purchasing anything!) needs to comply with GDPR in order to avoid potential hefty fines in the millions. Yes, millions. We scoured all our faves to get you the best GDPR info out there. If you have questions about the new regulation set to go into effect on Friday, May 25, take a look at our top three GDPR resources or consult your legal counsel. 1) What is GDPR and What is Your Web Host's Role in It? (SITEGROUND) - This fantastic Q&A webinar with our hosting partner Siteground and their legal counsel provides lots of useful information. 2) Get Ready for GDPR: Features You Can Start Using On Your Path to Compliance (HUBSPOT) - This is specific to forms, collecting and storing data and unsubscribing/opting out — all very important components of GDPR. 3) Are You GDPR Ready? (HUBSPOT) - HubSpot has created this handy checklist for becoming GDPR-compliant. If you collect data from anyone in the EU, you need to ensure that you are following GDPR guidelines such as asking them to agree to have you contact them in future emails and giving them the right to opt out. NOTE: If you collect data for a premium download (say, an ebook or a guide that you will email to them) and a user simply fills out that info, it does NOT give you permission to contact them again. Creating separate checkboxes can help you comply. See the HubSpot articles above for more information. Flair Interactive can help you install or configure WordPress plug-ins that can make some aspects of compliance easier to implement, so contact us if you'd like help with that. However, note that WordPress is not compliant out of the box. Users do have the right to opt out of some settings in GA, but you should tweak your Google Analytics tracking code to anonymize visitors just to be safe. (We are doing this by default for all web sites that we host on our servers.) In addition, you should confirm that the data retention policies in your new privacy statements align with the new data retention settings in Google Analytics. You've likely been bombarded by DOZENS of emails about how various software tools are handling GDPR. Check your existing software and reach out to those developers for guidance about their software. While we suggest you consult your internal GDPR champion or legal team to ensure compliance, don't hesitate to reach out to us with questions or if you need help implementing any of your GDPR changes.